Flight VA230’s Ariane 5 nears the ELA-3 launch pad during today’s rollout at the Spaceport. 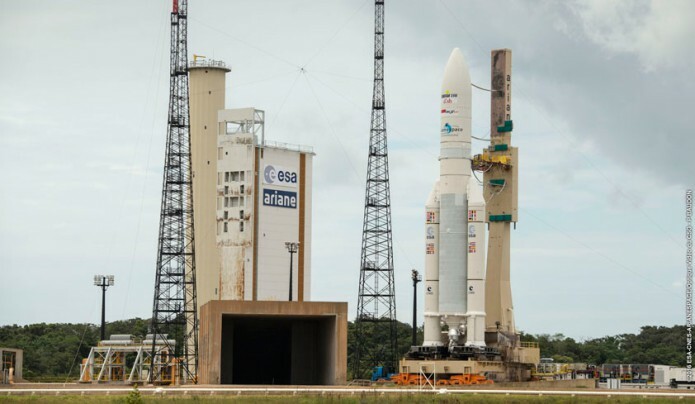 Arianespace has delivered another Ariane 5 to the launch zone at Europe’s Spaceport in French Guiana, positioning this workhorse vehicle for its June 17 liftoff with a dual-satellite payload of EchoStar XVIII and BRIsat. With the rollout completed, the final countdown will begin for a Friday liftoff at the start of a 1-hour, 10-minute launch window that opens at 5:30 p.m. local time in French Guiana. For this 86th flight of an Ariane 5 to date, the payload lift performance to geostationary transfer orbit is approximately 10,730 kg. – which includes a combined total of some 9,840 kg. for EchoStar XVIII and BRIsat, plus the launch vehicle’s dual-passenger dispenser system and satellite integration hardware. EchoStar XVIII – which was produced by SSL (Space Systems Loral) for DISH Network L.L.C. – is riding in the upper position of Ariane 5’s payload arrangement, to be released first in the flight sequence at 29 minutes following liftoff. BRIsat also was built by SSL and will be deployed from Ariane 5’s lower passenger position 42 minutes into the flight – completing the mission. Once in orbit, it is to be operated by PT. Bank Rakyat Indonesia (Persero) Tbk. (BRI).